Please bear in mind that this article was written many years ago, December, 1991. When prices are mentioned, please allow for this delay, as current prices are often a far cry from those quoted. Also other punch sets have been discovered. We don’t hear much about punch sets anymore except maybe the pastels. It hasn’t always been that way. Fifteen or twenty years ago we were quite occupied with punch sets and water sets. 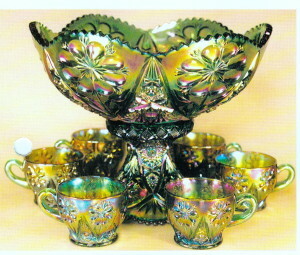 This has given way to the current popularity of plates, bowls, compotes, vases, rosebowls, etc. Part of this shift in attention is due in part to the fact these smaller pieces are easier to display. I expect, however, the major factor is the wider and more exotic colors in which they can be found. 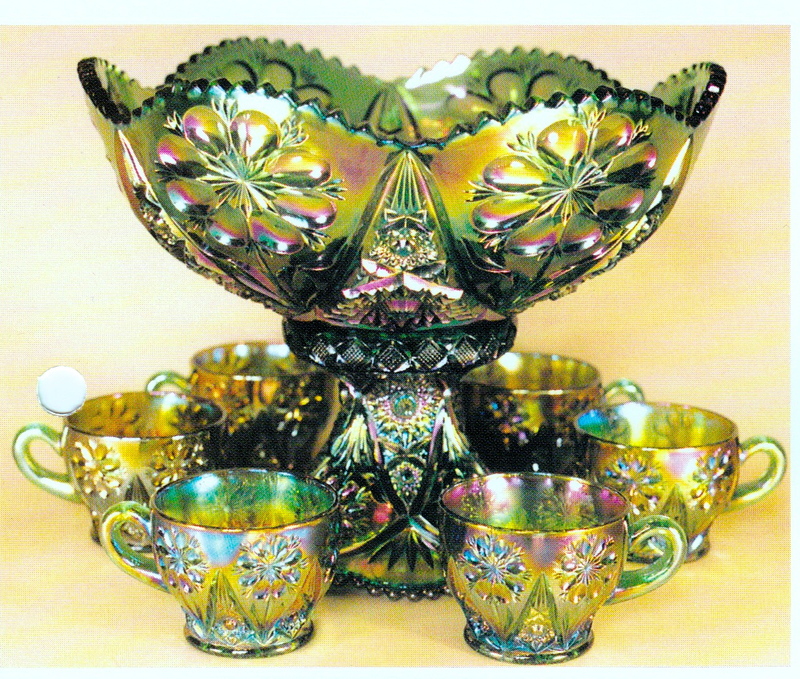 Not many punch sets or water sets were made in aqua opal, red, moonstone, peach opal, celeste blue, vaseline, amber, or even ice blue or ice green for that matter. Perhaps it is time to again focus some attention on punch sets. The accompanying color spread illustrates how beautiful they can be. Listing the top twelve sets is usually an effective way of getting your attention, so I’ll try it again with these sets. Please remember this is only one collectors opinion of how these sets should be ranked. AQUA OPAL ACORN BURRS (Northwood). This set in my opinion has to be given the number one slot. Only the one set is known but another base and several additional cups have turned up. This set, with five cups sold at Mrs. Hartung’s estate auction in 1983 for $12,500. 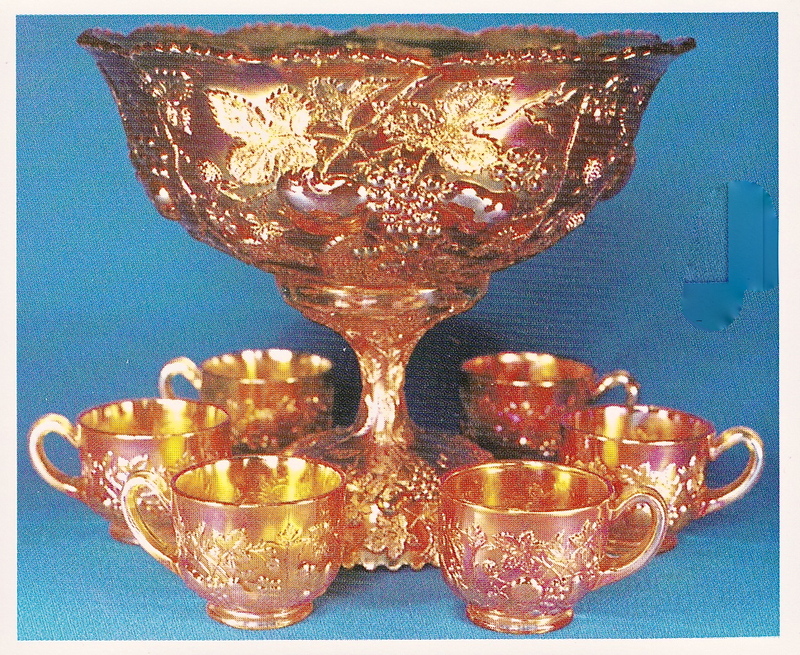 A single cup sold at the Britt auction in 1989 for $1800. 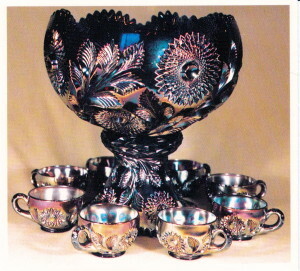 We added our sixth cup shortly after the Hartung auction for $500. AQUA OPAL PEACOCK AT THE FOUNTAIN (Northwood). 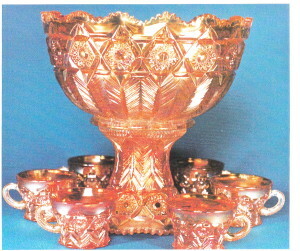 Three bowls and bases are confirmed but less than a dozen cups are known. 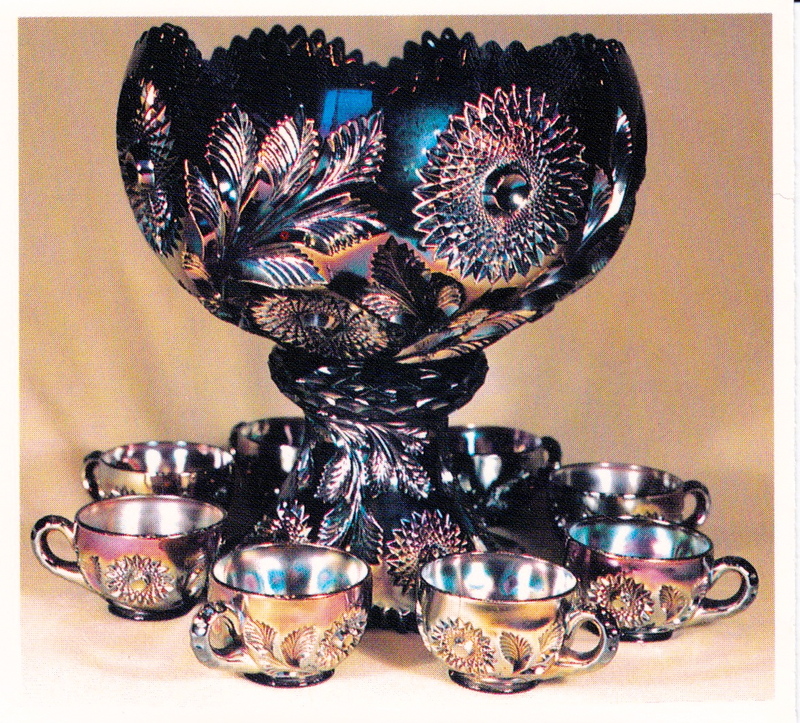 Like the Acorn Burrs, a single cup in this pattern also sold at the Britt auction for $1400. 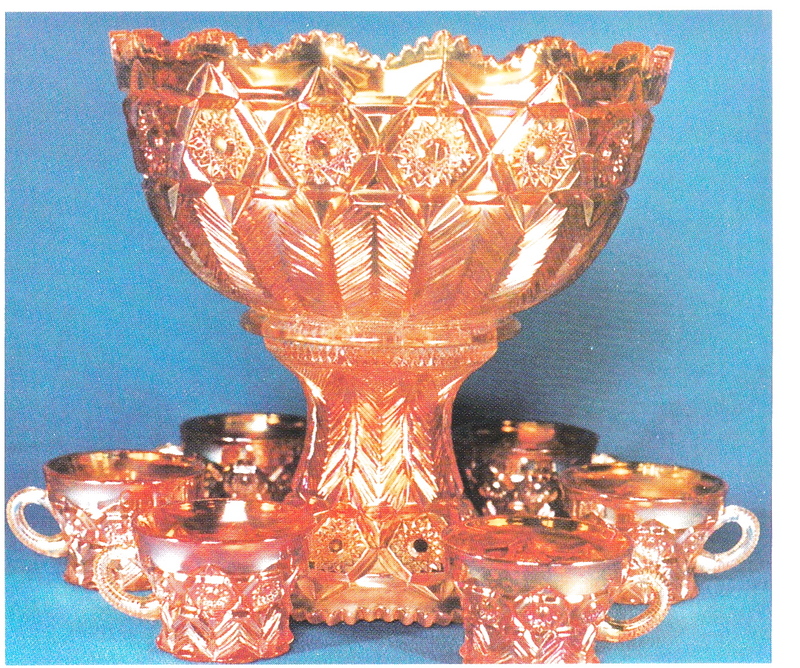 AMETHYST BIG THISTLE (Millersburg) Two of these bowls and bases are confirmed. One comes straight up but the other one flares out at the top. No cups are known. 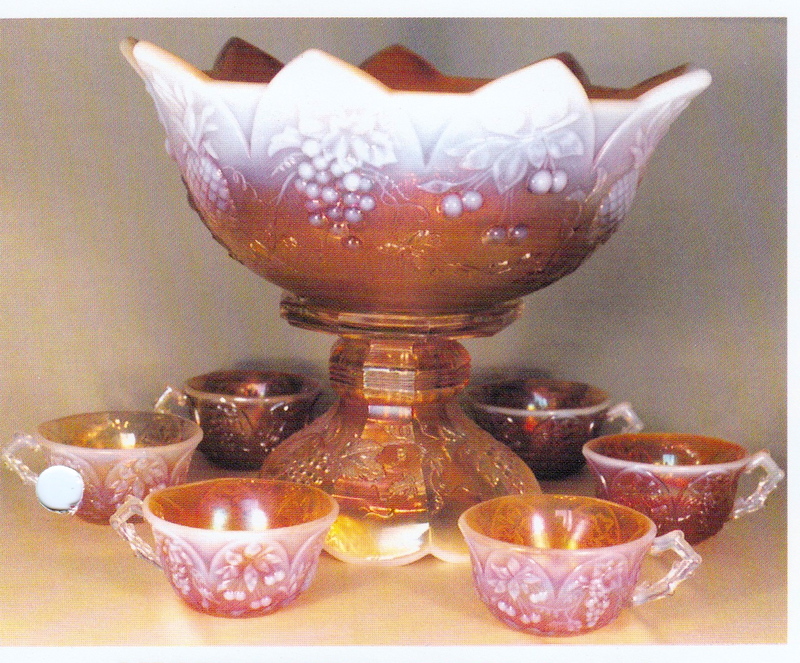 One of these bowls and bases sold at the Wishard auction in 1977 for $5800. ICE GREEN, ICE BLUE AND WHITE GRAPE AND CABLE MASTER (Northwood)Only the one set is confirmed in ice green. It sold for $4200 at the Roller auction in 1974. Three or four sets are known in ice blue and the same number in white. A white set sold for $6500 in 1988. LIME GREEN, ICE GREEN, ICE BLUE, AND WHITE ACORN BURRS (Northwood). A set in any of these colors is rare and desirable. Only one set is known in lime green. My estimate would be that some three or four are out there in ice green, six or eight in ice blue, and about the same number in white. 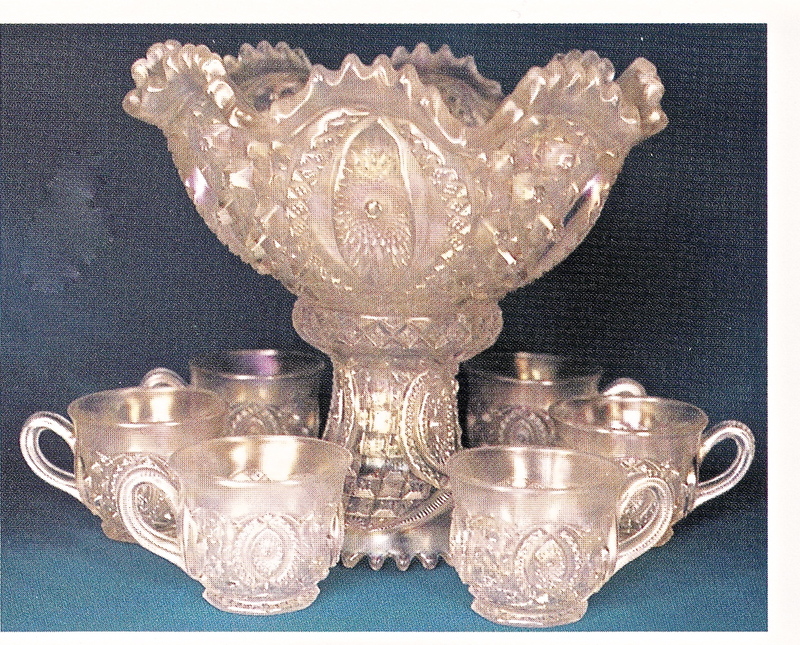 An ice blue set sold for $3750 at the auction 1985 and a white one for $2700 in 1986. An ice green set has not sold at auction to my knowledge. ICE GREEN, ICE BLUE, AND WHITE PEACOCK AT THE FOUNTAIN (Northwood). The sets in these colors pretty much follow the comments made concerning the Acorn Burrs. They are perhaps a touch easier to find. Over the past several years, ice blue sets have sold at auction for $2100, $2250, $2300, and $2350; ice green for $2500, $2600, and $2800; white for $2200 and $2250. 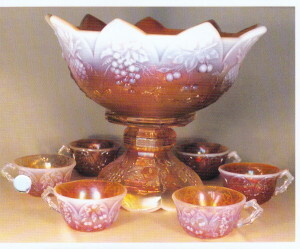 PEACH OPAL MULTI-FRUITS (FRUIT SALAD) (Westmoreland). There has been some confusion as to the proper name for this set. Sherman Hand called it Multi-Fruits while Mrs. Hartung used the Fruit Salad name. We have also been confused as to who made this set. It was long thought to be Millersburg, however, when we learned that Dugan-Diamond made most of the peach opal, we assumed this set was made by them. We now know it was made by Westmoreland. Less than a half dozen of these sets are known. To my knowledge one has never sold at auction. GREEN OR AMETHYST HOBSTAR AND FEATHER (Millersburg). These are very scarce. The marigold sets turn up now and then, but the dark sets are seldom seen. Three amethyst sets are known with the tulip shaped tops and that may be about the extent of the sets in this color. 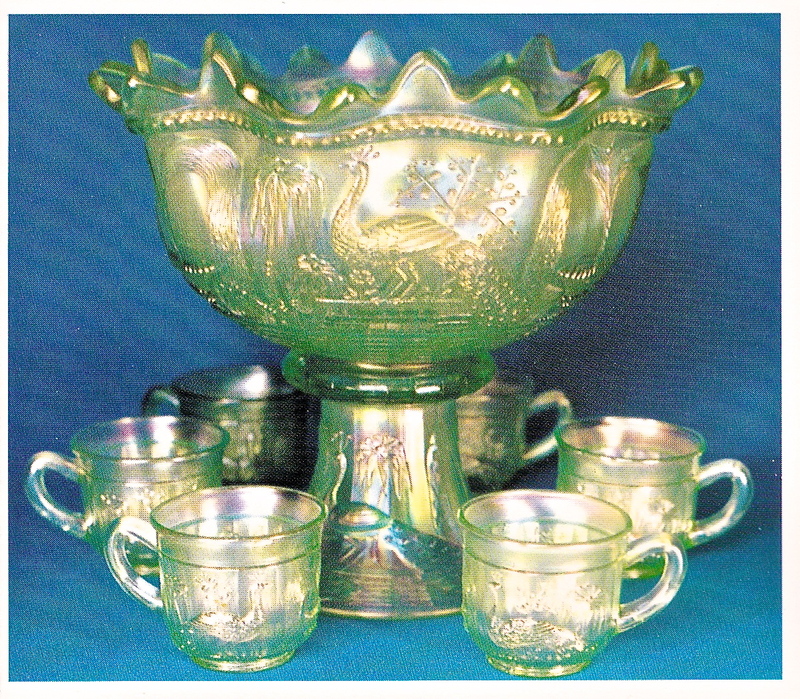 One of these, with green cups, sold at the Clark auction in 1974 for $3100. A second amethyst set to sell in recent years was at the 1982 Wilson auction. The bowl was glued together. It brought only $350. I have seen only one green set. It was flared out at the top rather than tulip shape. GREEN, AMETHYST, OR MARIGOLD DIAMONDS (Millersburg). 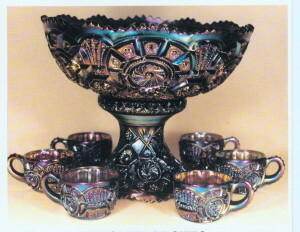 One bowl and base is known in each of these colors. No cups have ever been found. 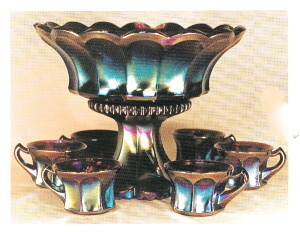 A bowl and base in amethyst with some damage sold for $800 at the 1982 Wilson auction. They sold a second time the following year for $900. 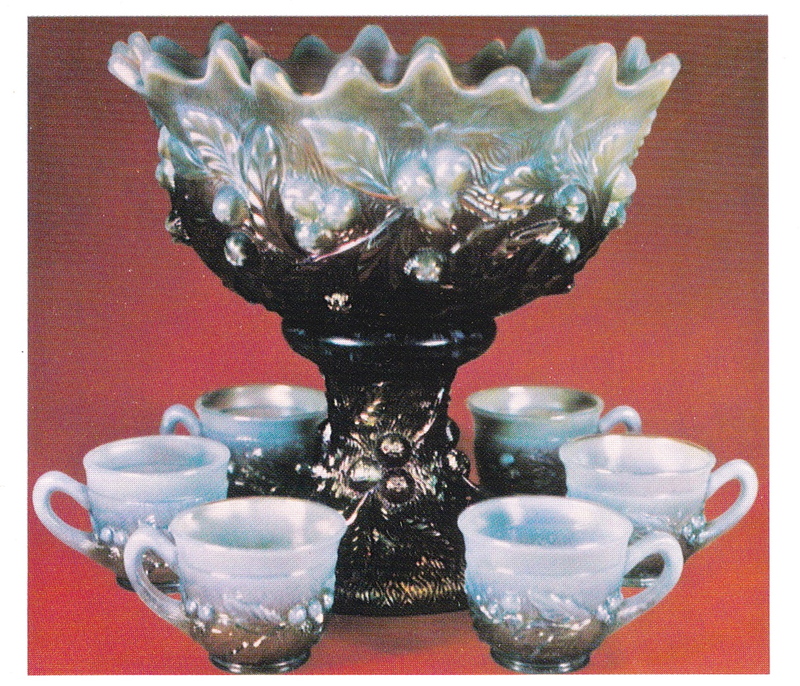 The marigold bowl and base with six tumblers pictured in the color spread, sold for $1600 at the American Convention in 1986. 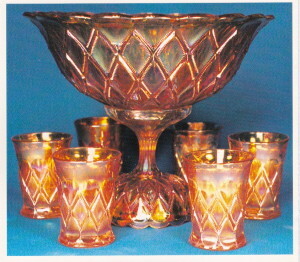 The original owners said the tumblers had always been a part of the set. 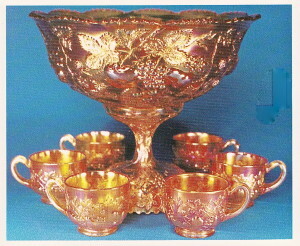 It’s entirely possible this was the intent of the maker since it appears no cups were ever made. GREEN AND MARIGOLD INVERTED FEATHER (Cambridge). This is a very rare set and it’s a shame it has to be this far down the list. 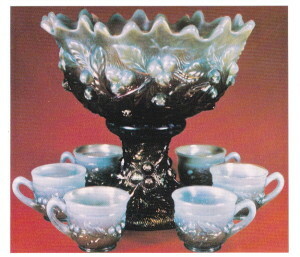 One bowl and base is known in green. The bowl is cracked and the base is chipped. It sold for $275 at the Garner 1983 auction. The marigold set shown in the color spread is the only one known to my knowledge. 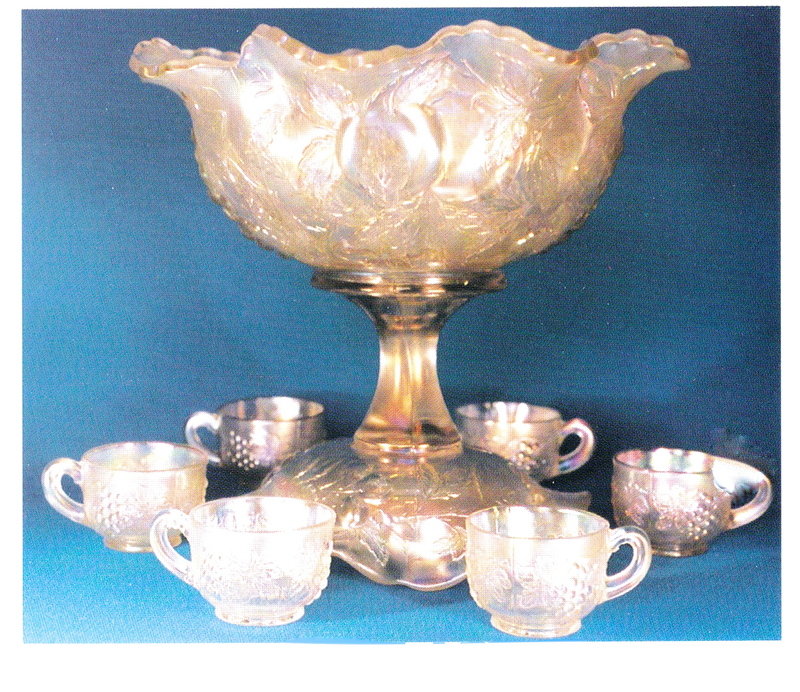 The bowl and base was originally owned by the Bredel’s from Milwaukee. 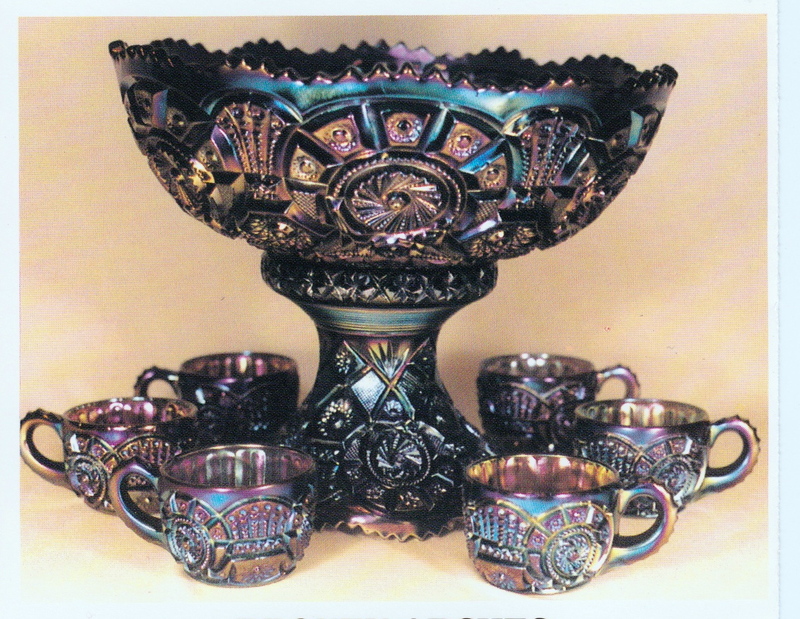 We later acquired the cups from Jack Wilson, Chicago. These came off of a damaged bowl and base, I understand. Well that’s the top twelve as I see it. It’s a shame there isn’t a slot for some other very scarce and beautiful sets. Among those are the green and purple Four-Seventy-Four, purple S-Repeat, white and blue Many Fruits, purple Flute, and purple Broken Arches. A number of these are shown in the color spread.